An Aberdeen-based subsea company has marked the second anniversary of its launch by signing an exclusive partnership deal that will bring PartnerPlast’s full product line to the UK for the first time. Orca Subsea, a specialist in engineering services for the diving and subsea industry, has been appointed the sole UK supplier for PartnerPlast, a manufacturer of offshore equipment. As part of the deal, Orca will provide buoyancy and other assorted products; focusing on offshore and subsea, rotational moulding, and aquaculture. Orca was founded in November 2015 to provide a range of support services, tailored to diving and subsea contractors – including dive system management, mobilisation support and brokerage. Despite launching during the industry downturn, Orca has doubled its workforce to eight people in that time and successfully developed several innovative products. This includes the Orca suite of management applications, Orca Mobilisation Manager and Equipment Manager. Both tools are designed to assist in project execution by increasing visibility, accountability and efficiency through collaborative cloud-based, real-time reporting, RFID, GPS, and project management tools built into the applications. “We are excited about the opportunity to work in partnership with such a well-respected firm as PartnerPlast. Especially in the current climate, this move strengthens our existing capability and service offering to new and existing clients, while providing a significant competitive edge,” adds Masson. Earlier this year, Orca signed an exclusivity agreement with Geoforce to provide its complete range of GPS tracking tags and live reporting tag solutions to the UK market. The company completed immersion tests on the tags to ensure they could be safely used at depths up to 200 metres. 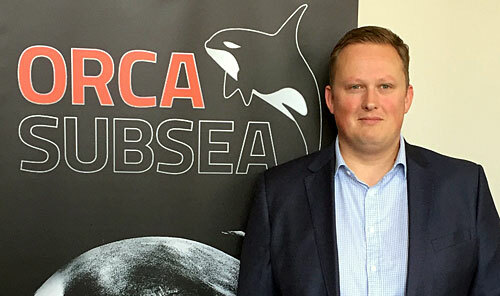 In addition, Orca has also signed partnership agreements with CoreMarine for engineering services and mobilisation support in the UK and Norway. Both the Equipment Manager and Orca Mobilisation Manager have now been successfully deployed with key clients, including top-tier subsea contractors, and continue to attract significant interest within the offshore and renewables industries. The final product added by Orca this year is an innovative range of diver and tooling A-frames, which have been designed to be stackable and easily transportable, as well as being quick to deploy and mobilise on-board a wide range of vessels or offshore installations. Orca Subsea, which currently employs eight people with additional specialist contractors, opened a base in its hometown of Aberdeen in late 2016 – which now acts as the company’s main operations hub. It also has a support office in Malaga, Spain. Recent projects completed by Orca include supporting a client’s decommissioning scope by providing a fully refurbished winch spread and hire of cutting equipment. It also delivered planned maintenance systems and equipment management services for multiple air and saturation systems in the UK, Europe and Asia. Masson adds that the Granite City remains an ideal location for marine-based activity, with a growing number of new business wins coming from the local area. He credits much of Orca’s success to its workforce.